Offering decorating and design services and products to meet any need, Blinds & Drapery Showroom is your go-to source for beautiful custom draperies and window treatments. We offer an extensive variety of luxurious decorator fabrics, trim, and drapery hardware to suit any style. 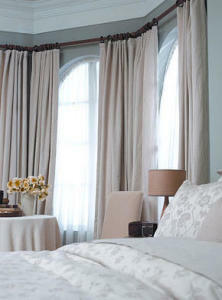 Whether you need a simple valance, elegant roman shades, or and entire room re-dux, we can help. Call for an appointment with our Design Specialist, Monica Trexler. A recent transplant from the DC area, her work has been featured in several decorating and design publications as well as on HGTV. Stop in to see what she can do to help transform your spaces.